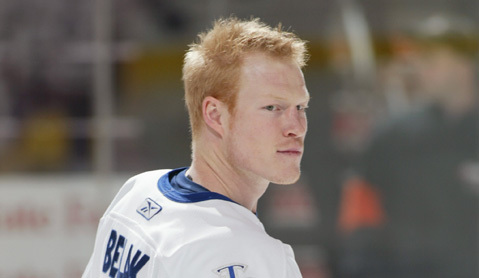 The world lost Wade Belak on Wednesday. It was the second time in just over two weeks the NHL has lost someone close to the community, as Rick Rypien passed on the 15th of August. Both cases seem to be by way of suicide. This is also the third death this off-season, including Derek Boogaard's passing earlier in the summer. While Belak wasn't always a guy who jumped out on the score sheet for goals or assists, he was a fan favorite and a guy who was always there to help out the team with an energy shift or to stir up things with the other team. He was always there for the media to give a quip and always seemed to have a light-hearted person. He was a character. On the ice, Belak was a scrapper, but it seemed off the ice, he was a teddy bear. The most heartbreaking part of this is him leaving behind a wife and two young daughters who may never know the answers as to why. While people are quick to jump on sides and try to play armchair commissioner; it's not that easy. People can clamor for change as much as they want, but by all knowledge; Belak didn't have any known cases of depression nor concussions (according to him, at least). He was a character and always seemed to be a happy-go-lucky guy. The world is less without him on it anymore. But as far as people blaming the NHL or NHLPA for not doing enough to help out their players-- who's to say they didn't?? Like I mentioned and has been mentioned abound, it didn't seem like Belak showed any symptoms of depression and it hasn't be documented that he ever requested to go into the program at all. As I mentioned in my post about Rypien, there's a lot of times where guys aren't going to broadcast their problems out there. A lot of guys are on guard because of the profession they got into. They have a strong pride factor with their toughness and if they even show some vulnerability, it could be seen as weakness and they never showed weakness at all. People can go on and on about the programs and how the league and the PA needs to get harsher on testing and monitoring of players-- but you cannot force someone to go into these programs. They aren't children and if they feel there is nothing wrong; you have to trust them-- especially if they aren't doing any harm to themselves or others outside of the rink. Any kind of program a person gets into when it comes to depression is only as good as the person who is getting the help. The NHL and NHLPA could have thrown every available option at guys like Rypien and Belak and it still may not have been enough. Hell, Rypien was in a program a couple times and wasn't rushed at all to come back. He had the wherewithal to actually voluntarily go into the program; because he knew something was up and wanted to get himself better. There's no cure-all for depression, and while the psychological part of it all is just as important as the physical part-- it's much, much harder to diagnosis and to treat; especially if someone believes they are okay the way they are. All the medicine, counseling, and time in the world could be given to any player-- and it still may not be enough. Because of that-- you cannot blame any party involved. These are sad happenstances that occur and sadly, would have occurred regardless of how early it was caught, how much medicine was given, how much advice or life changes were suggested. That the messed up part of the brain chemistry; no one really knows how someone else feels and you have to be trusting if they aren't showing any signs. People can go on and on about how fighting or overly physical nature of the game is to blame; but sometimes that's not always the case. These players are also humans-- they have real-life issues, real-life problems, and are just like you and me; but put on a highly pedestal because of their skills they were able to pick-up through playing a game they love, which they turned into a career. It's easy to lose sight of the humanity of the situation until it turns tragic. God speed to you, Wade-- I hope you have found peace. To the Belak family, my deepest condolences to you all and I hope one day you may all find some peace in all of this. To those reading this-- hug the ones you love today and let them know you love them. And hopefully I won't have to write another one of these for a good, long while.